The iPhone X is an expensive glimpse into the future iPhone X Review: The Future Has a Price iPhone X Review: The Future Has a Price The iPhone X is a flagship, business-class device. It's the first generation of a new generation, and such devices always come with a few pitfalls. Read More of smartphone technology, and the crown in the jewel is Face ID. Using infrared and an array of scanners on the front of the device, the iPhone X can recognize who you are and where you’re looking Is Face ID on the iPhone X Any Good? Is Face ID on the iPhone X Any Good? Gone is the home button. Gone is the fingerprint scanner. It's time to make way for Face ID. Read More , to unlock your phone and authorize purchases. The other thing those sensors can do is map your face onto an emoji character, something Apple has dubbed Animoji. Who said cutting edge technology needs to be useful? 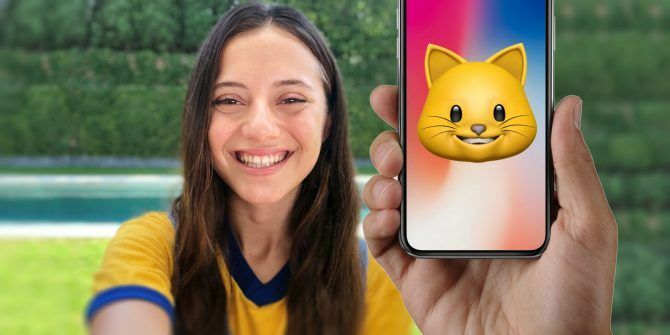 Here’s how to send and save Animoji on your iPhone X.
Animoji is animated emoji, except the animations are recorded using your own face. The feature is exclusive to the iPhone X at present, since it relies on the infrared scanner array that can only be found in Apple’s latest smartphone. Essentially, it’s a glorified Snapchat filter, but with far more potential. Apple uses its Face ID scanners to detect the movements of more than 50 facial muscles, including head tilts, nods and mouth movement. The only thing I couldn’t get working is winking with one eye. Animoji lives inside the Messages app, and presently there’s no way to use it outside of this app. Apple maintains anyone with iOS 11 can view Animoji, but considering they’re just short 10-second videos you may be able to send them to other friends. Messages doesn’t fence-off Animoji if the recipient isn’t using iMessage, put it that way. When you record Animoji, you also record the audio, so you can talk, sing, or rant if you want. It’s also possible to pull an expression and use it as a static iMessage sticker 12 Cool Things You Can Do With iMessage Apps for iOS 12 Cool Things You Can Do With iMessage Apps for iOS You can do a lot more than simply send text, voice, picture, and video messages with iMessage. Read More . Now you’ll see your chosen emoji in the middle, with a selector on the left that allows you to switch to another. Rehearse your message or animation, then when you’re ready you can hit the red Record button to grab up to ten seconds of animation. If you hit the record button early, you’ll create a shorter video. When you’re happy with your Animoji (and remember, sound is also recorded) hit the send button (blue arrow) and wait for the upload to complete. Another option is to use the expression-mapping to grab a static sticker. This might actually take you less time than finding an equivalent emoji, assuming you’re happy to pull silly faces at your iPhone in front of strangers on the train. To do this, simply hit the Animoji button, pull a face, and then tap and drag the character into your message window. One of the biggest drawbacks to Animoji is that the feature currently only exists within the confines of the Messages app. Apple didn’t make a dedicated Animoji app, so if you want to use your animations elsewhere you’re going to have to work within the limitations imposed. To save an animation to your Camera Roll, you’re going to have to send it to someone first. There’s no option to simply record, then save and discard. One way to get around this is to send the Animoji to yourself. Just start a new Messages thread, input your own number or email address, and send your message. When the message delivers you can simply tap it, then hit the Share button and choose Save Video. If you want to send the animation to Facebook, Twitter, or anywhere else, use the appropriate extension within the Share sheet. Since the iPhone X launched, some users have taken to using the feature to lip-sync their favorite songs and share the results with the world. One problem is that the feature is limited to videos of ten seconds or less. So how do you record a whole song? Simple: you capture the screen instead! iOS 11 has a built-in screen recording function, which allows you to record what you see on-screen. You can enable this feature under Settings > Control Center > Customize Controls and select Screen Recording. Now return to Messages and launch Animoji. Swipe down on the top-right of the screen to reveal Control Center, and hit the new Screen Recording button you just enabled. You can now record your animation for as long as you like, provided you have the free space on your device. Note: You should 3D Touch the screen recording button and enable your microphone if you want to record audio too. End the screen recording by tapping the clock in the top-left corner. Your video will be saved to the Camera Roll as a full-screen capture. In order to share it, you’ll want to crop the video so that only the Animoji is visible. I used an app called Crop Video Square (watch out for trashy in-app purchases) but there are tons to choose from. A better way of working is to record your iPhone’s screen using a Lightning cable and Mac Record Your iPhone or iPad Screen Over Lightning With Your Mac Record Your iPhone or iPad Screen Over Lightning With Your Mac Apple has made recording easier with a "hidden" feature to OS X Yosemite that lets users stream their iPhone or iPad display to a Mac. Here's how it works. Read More , then use something like iMovie for Mac to crop out the UI. At present, Apple is only one who has created anything that uses the TrueDepth camera to do anything like this. More will inevitably follow, and Snapchat filters will undoubtedly get more sophisticated and interactive. Until then, we’re stuck with the basic Messages implementation. One developer has gotten his hands on the Animoji API, and developed SBSAnimoji. It’s an app that operates outside of the Messages app, and it doubles the length of the recording to 20 seconds. Unfortunately, it’s unlikely Apple would ever approve it on the App Store, so you’ll need to sideload it using Cydia Impactor How to Jailbreak Your iPhone or iPad (iOS 10.2) How to Jailbreak Your iPhone or iPad (iOS 10.2) Even though you probably shouldn't jailbreak your iPhone, many of you are going to do it anyway, so here's how. Read More . What do you think of Animoji? Did you buy an iPhone X? Let us know in the comments below. Explore more about: Emojis, Face Recognition, iMessage, iPhone X. Not listed: How to actually GET an iPhone X, since stock has been limited. Is Face ID on the iPhone X Any Good?